"When we invite the healing frequencies of Reconnective Healing in, we literally begin to vibrate at a frequency that helps to change the structure of our muscles, organs and our DNA, transforming us on a cellular level. Glen Rein, PhD, Director of Quantum Biology Research Laboratory in NY, demonstrated that when Reconnective Healing is applied to DNA the DNA's defects are corrected as it is healed." - Dr. Eric Pearl. Reconnective Healing is accessing a broad spectrum of vibrational frequencies that are so high that ailments are quickly alleviated. The intelligence of these self-correcting frequencies surpass human comprehension and extend far beyond the immediate time zone around us. In this quantum field of existence you are returned to an optimum state of balance. A shift may be happening within your cells as part of a DNA activation as you begin to emit more coherent levels of light. The changes facilitated by a Reconnective Healing Practitioner occur regardless of belief system and does not does not require faith, intention or other types of conscious thinking. The Practitioner's role is simply to be a facilitator so that an interaction between the energy, light and information can reach the client directly. Once an individual has interacted with the frequencies they are attuned to a higher vibration than prior. It is generally recommended to experience one to three sessions for optimum results over a seven to ten day period. 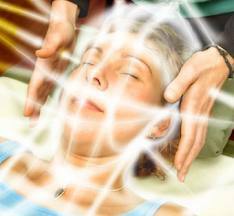 It is recommended to approach the healing session without expectation to a particular outcome. Simply be relaxed and let go, as if you had a little unexpected relaxation time. What will I experience during a session? During a session you lie down fully clothed on a massage table and it is a hands-free interaction with the energy field surrounding your body. The Practitioner work with her hands to sense and manipulate the energy field and this may be experienced through bodily movements, known as registers or physical sensations. These movements can be very tangible. They are visible signs of connecting to the frequencies, but do not have to be observable for a healing to take place. The most common involuntary movements are tiny muscles on the forehead or chin that usually cannot move intentionally or independently, pulling at eyebrows, rapid eye movements, a change in breathing pattern, being able to hear yourself snore (entering into an altered state of awareness), fingers, arms and legs jerking and tummy rumbling. The u-tube above demonstrates a clients' involuntary movements during a Reconnective healing session. What is the difference between Reconnective Healing & The Reconnection? The difference between a Reconnective Healing session and The Reconnection is one of intent. Reconnective Healing is for healing in the body either physically, mentally, emotionally or spiritually whereas The Reconnection is for life path acceleration and personal growth. It may also be an opportunity to re-connect our subtle body, light body to the lay lines of the planet. Each session takes 45 minutes and cost $95.00.